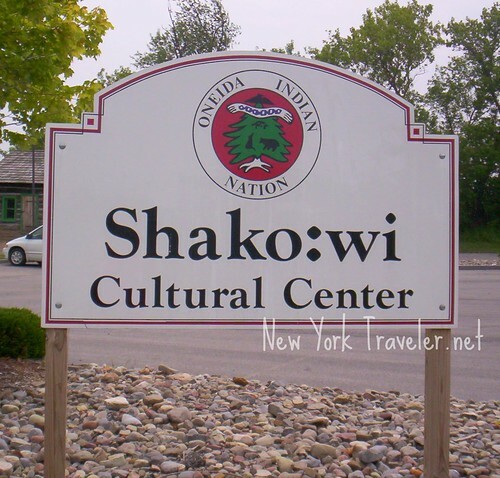 This is a post about our visit last summer to the Shako:wi Cultural Center in Oneida, NY. It is a beautiful museum about the Oneida Indians of Upstate New York. There is a window to the world which is the Oneida Indian Nation. It’s called Shako:wi Cultural Center. 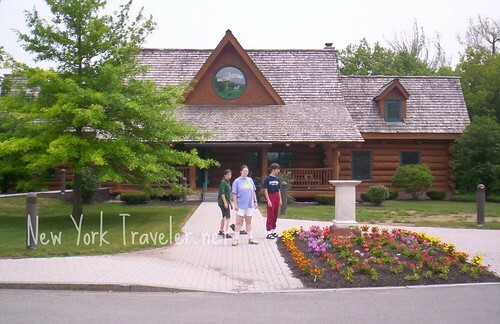 Housed in an impressive, handcrafted, white pine log building, it is filled with items and stories from the rich past and present of the Oneida People. A continuing theme of the cultural center is the role the Nation played as the first allies of the colonists during the American Revolutionary War. Also, a wide selection of Oneida crafts and art fills the log walls and many displays of Shako:wi. The cultural center is more than a static display of things created in the past. 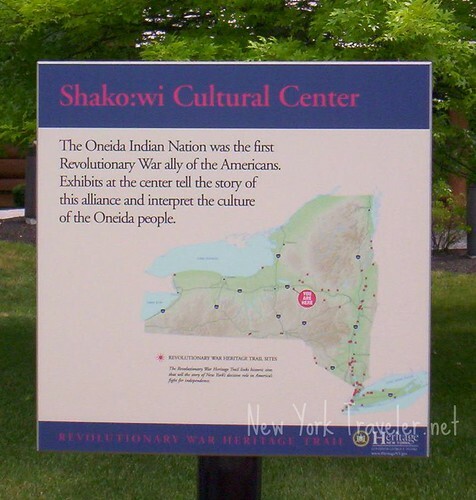 The Oneida People have made Shako:wi a lively place, using it for gatherings and presentations about their Nation and their traditions. The Center was a little hard for me to find. Directions say “turn left at the flashing light.” My left-hand turn took us down a small road with some houses, a clinic, some new buildings, and a burial grounds. No Shako:wi. 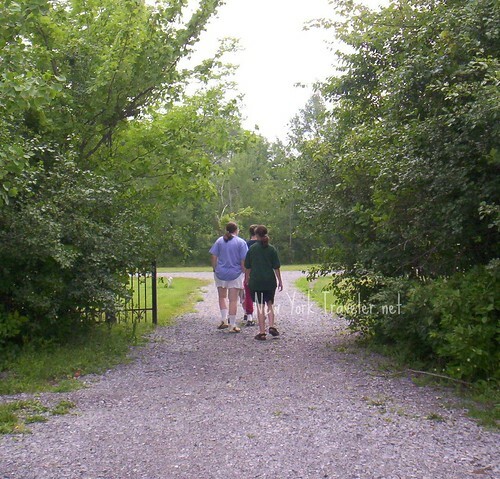 The burial grounds piqued our curiosity, so we quietly walked in. The cemetery looks very new. Only a few headstones were placed, but the names seemed familiar, for some reason. We turned back and I continued to venture on. Ah! The Shako:wi Center is behind a SavOn convenience store (owned and maintained by the Oneida Nation). I parked and we were wowed by the beautiful log structure. The logs were HUGE. The Center was constructed by the Oneidas, all logs hand-hewn and handcrafted to fit together without spikes or nails. The Adirondack White Pine logs are absolutely beautiful. We were also so pleased to see a memorial to Skenadoah (a favorite historical figure of ours) and his original burial monument. What a great man he was. We were unable to take pictures inside the museum. I was very disappointed, because it had so many wonderful things that I wanted to blog. However, the Shako:wi website has a really nifty online tour that you can browse, and also has numerous pages displaying some of their exhibits. Shako:wi opened in 1993. The quantity and quality of the museum’s items are staggering. There was so much! We walked around for about an hour, soaking all the information in: the exquisite beadwork (who does stuff like this anymore?? well, the Oneidas still do! ), the weapons (my boys loved this section), the art of basketry, herbal medicine (I didn’t know there was some good use for that annoying weed, the plantain! ), and tobacco pipes. Guess the Oneidas wouldn’t have had “social security” or other Ponzi schemes to dump on their kids, eh? Toward the entrance is a very large painting of the “Peacemaker,” an aged white-haired, kindly-looking man. His hair grows long around him and cradles the people sitting beneath him. He holds a two-row wampum that can be interpreted to say that as long as the U.S. Government and the Five Nations respect but do not interfere with each other, they will journey with each other side by side in peace. On the other side of the room, the replica of the Treaty of Canandaigua (signed in blood by the Indians) and articles of Oneida displacement from their land speaks volumes. I have said before that our Founders made treaties with these allies, and we are responsible to keep them. A testimony to the treaty’s everlasting viability is the yearly disbursement from the federal government of annuity or treaty cloth to Nation Members. Although the disbursement has changed over the years and the amount of fabric diminished, the symbolism of the cloth remains steadfast. The Oneidas take the Treaty very seriously. Another sacred symbol of peace treaties was wampum. Wampum is still exchanged in meetings today. The Oneida Indian Nation has a great page and a photo of their wampum here. 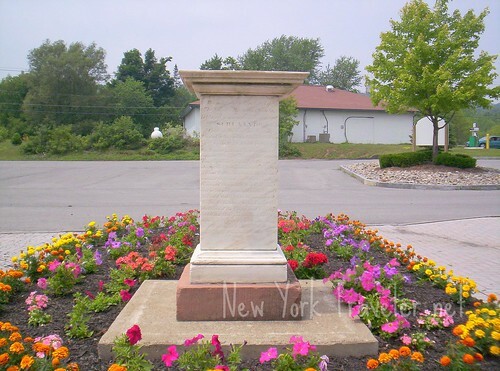 Another point of interest was the unique social order of the Oneidas. Compared to European culture, Oneida women had unusual authority in their group. Women chose male chiefs and could start and end wars. Women contributed their voices to consensual decisions pertaining to the village or the Nation. Membership in the Oneida tribe was determined solely through the female line of descent. I chuckled because in all the TV shows and movies (from where we get our images of Indians) always show the men in complete control and the women plowing the back 40. Another interesting display was the “kasto:wi”: the traditional headdress of the Iroquois Confederacy. A member of the Six Nations could be identified by the type of headdress the Indian wore. Seneca kasto:wi is a headdress with one vertical feather; Cayuga kasto:wi is a headdress withone feather pointed down; Onondaga kasto:wi is a headdress with one feather vertical and one feather down; Mohawk kasto:wi is a headdress with three upright feathers and one feather down; the Tuscarora kasto:wi had no feathers. I did so want to snap a photo of the display! Apparently this was a popular area where others have felt such temptation, because a large sign was prominently taped to the glass forbidding cameras. The Haudenosaunee… influenced our Founding Fathers’ ideas on democratic thought and helped forge the idea of Federalism. Ben Franklin and Thomas Jefferson used the Great Law of Peace to help write the Constitution of the United States of America. Unfortunately, that information is erroneous. The Founding Fathers (many of whose writings we have personally read) did not aspire to democracy or democratic thought; they despised democracies. And Thomas Jefferson did not write the Constitution. He was in France during that time, for many years serving as ambassador to the US there. He did not offer any input besides writing letters back and forth to Virginia delegates. There is no record of any Founding Father using the Great Law of Peace to write the Constitution. During the Convention when the Constitution was debated over and written, there were many documents, books, and papers distributed and read.There was a meticulous record of everything discussed, read, and debated. Nothing was mentioned of the Iroquois nation’s influence (although that is not to say the Iroquois didn’t have indirect influence– they did). As far as Benjamin Franklin, he drafted a plan called the Albany Plan of Union in 1754. He said that he admired the Iroquois way of self-governance. However, the Plan of Union was rejected by the colonies at that time. The Plan of Union had a “republican” flair to it, but the Founders did not specifically refer to it or to the Great Law of Peace when drafting the Constitution. The Founders referred more to the Bible and Blackstone’s Commentaries on the law to draft the Constitution, actually. I wrote the historian of the Cultural Center informing her of the inconsistencies. I don’t know how many people actually read brochures (as we zealously do), but I figure a historian would want to know if information in their brochures are inaccurate. I would if I were a historian, anyway. However, it should not be overlooked that the Oneida Indian nation was the only Iroquois ally of the Americans during the Revolutionary War. They sacrificed everything to join our cause, and the memory of the forefathers should be respected with great honor. I am grateful for those people who fought that I might live free in this country. After our visit, we tried to pick up conversation with the one receptionist at the Center. She was oddly aloof, and just referred us to the brochures. I was curious about how the ministry of Samuel Kirkland and Skenandoah affected the rest of the Oneida tribe; I’d read that many became devout Christians. I wondered aloud if this was true, and what happened to the Christian movement with the Oneida tribe. The receptionist seemed uncomfortable (perhaps from anti-land trust interrogators? ), and told me I would have to ask a historian. I was disappointed. I liked the Cultural Center, but it dealt mainly with the Oneida ways before the Revolution, and the displacement of the tribe after the westward expansion. I am curious to know about the “gaps” as well. The history of America’s indigenous peoples is truly fascinating. It is a contemptible tragedy that “manifest destiny” turned our American nation against our Indian allies and friends. The Shako:wi Cultural Center is beautiful and offers fantastic displays of genuine Oneida culture. It was a pleasure to visit (and admission is free!). We hope to go again sometime, and perhaps I’ll run into a talkative historian next time! Wampum photos courtesy of the oneida-nation.net website. Good post – back in 1995 I worked with Douglas Cardinal Architect on the design and construction documents for the very curvy Oneida Turning Stone Casino. It was nice to read this story about the Oneida – brought back some very good memories of working with them in New York. I’ll stop in to see this next time I’m down that way. I was wondering where this museum is located at? You say there is a savon in front of it. The only one I can think of is Route 46 in Oneida. im looking for the name of the artisit who painted the three clans painting at the cultural center. i think he is onondaga, and i think his last name is thompson. please let me know if he has a website. yawko!